Staples' #1 Caroline Kearney, left, and New Canaan's #7 Abbey Buckenheimer chase down the ball, during girls field hockey action in Westport, Conn. on Wednesday October 5, 2011. 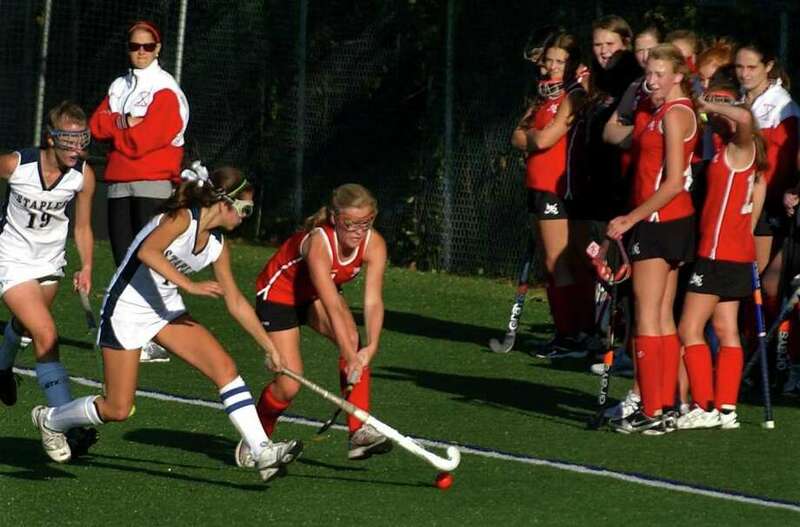 The Staples field hockey team continues to make strides, even when it doesn't win. Host Staples showed it Wednesday when it played New Canaan to a 2-2 tie -- a team it hasn't garnered a point off of in years. "We came off two intense games [a 3-2 loss at first-place Wilton Tuesday] and the girls are emotionally and physically drained," Lady Wrecker coach Cecily Anderson said. "They gave it their all and I'm proud of my girls. They are spent and will get much needed rest." Staples is now 5-3-1 and New Canaan moved to 4-1-1-1. Like many ties, both teams took turns dominating the game. Staples carried play in the first half while New Canaan had the upper hand in play in the second half and overtime. The Lady Wreckers outshot the Lady Rams, 6-3 in the first half and had a 4-2 advantage in penalty corners. Staples had a 10-9 edge overall in corners. It all started for Staples with Callie Hiner, Emily Ashken and Misha Strage. Hiner was strong defensively, cleared many balls and pushed it up to the offense. "We just had to contain them and keep our positions," Hiner said. "I tried to find the outside players." Ashken controlled the midfield and got off an early blistering shot, which New Canaan goalie Britt Gardella (six saves) made the save on. Strage pushed the ball into the offensive zone and created penalty corners and other opportunities for the Lady Wreckers. The Lady Rams matched up well defensively and repelled almost all of Staples' potential attacks with Bridget Falcone breaking up plays and sweeping many balls out of her defensive end. Although the Lady Wreckers controlled play, the Lady Rams had a few opportunities in the first half and moments where they could have taken the lead. New Canaan's Molly Stine fired a blistering shot on net but Staples goalie Chris Lueb (six saves) made the save. Falcone apparently gave the Lady Rams a 1-0 lead when she fired in shot with 8:00 remaining in the half off a penalty corner but was ruled to be outside the circle. Jackie Lawrence, Josie Fair and Meghan Fox also played well defensively for Staples and classmate Sami Bautista and Noortje Lueb had a few good rushes inside, but was stopped by either Falcone or Wilks. Lady Wrecker freshman Elizabeth Bennewitz got to some balls in the midfield and helped push it to the attack zone. With 2:43 left, Strage, who was credited with the assist, took a shot and Shelby Phares deflected it in to give Staples a 1-0 lead. This was the score at the half. "Spreading the ball wide to Shelby, which is how she scored the goal," Strage said. Although both teams had five corners in the second half, the Lady Rams were in control, especially for the beginning. Falcone got things going with an outlet pass to Maureen Schott and Bea Eppler. Lueb went out to make the save, but left both Eppler and Schott heading to an open net. Caroline Kearney broke up the play for the Lady Wreckers but New Canaan earned a penalty corner. Eppler passed it to Falcone, who set up senior tri-captain Melanie Sztorc, who swept it in for the goal to tie it 1-1 with 26:20 to go in regulation. Both Eppler and Falcone were credited with assists. Eight minutes later, Staples lost Ashken to an injury. "We missed Emily's strong play in the midfield," Hiner said. "I think we had a better chance with her but we composed ourselves well." Anderson said, "I think her leaving the game shook things up and took us a bit to regroup. I think it made a difference but I can't say for sure we would have won [if Ashken didn't get hurt]." Kearney said, "I think it made a difference. It's hard not to have our center midfielder. We pulled it together and tried our hardest." Later in the half, Kearney and Lueb blocked a shot by Victoria Bruno. But Bruno got the rebound and crossed it to freshman Isabel Taben, who swept it home and gave the Lady Rams a 2-1 lead. Staples started to pick it up. Kearney elevated her game and Fair won a ball in the midfield. "When they were on our side, we tried not to get it to the middle and the defense did a good job of recovering," Kearney said. Strage stole it in her offensive zone and fed junior Megan O'Shea, who scored with 8:42 left to tie it 2-2. "I just felt the energy, saw the ball and I did what I had to do with it and got the job done," O'Shea said. Strage said, "Megan was open and I saw her. I knew I had to keep my stick down and I wanted to win." Anderson said, "I'm happy we're a team that can come back. It's a good muscle to flex." Neither team scored after that. In overtime, New Canaan had a 2-1 edge in penalty corners. The Lady Rams had a chance to win the game when Eppler set up Alexa Ozimek off a corner but Chris Lueb made the save to preserve the tie. "It's nice to get a point from them," Strage said. "A win would have been nicer, but it's tough going back-to-back. They are a good team."